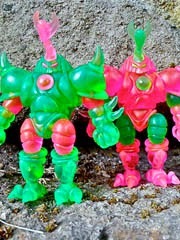 Your friend and mine Marty TheGodBeast Hansen updated his site with a look at two new Kabuto Mushi figures, cast in the most beautiful pink and green you could ever hope to see. This translucent duo will go on sale this weekend. Other colors include the Glyaxia Yellow/Blue mix, and two more which have yet to be revealed.